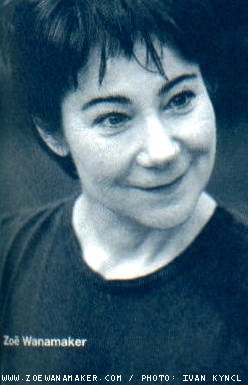 The first and second photos show Zoe Wanamaker in rehearsal for Battle Royal. The third shows her on stage as Princess Caroline. Against a backdrop of war and revolution, and set between 1795 and 1821, Battle Royal charts the troubled marriage of George, the Prince Regent, and Caroline of Brunswick, a fiery German princess. Having married Caroline as part of a desperate deal to clear his debts, the Prince quickly shuns his bride in favour of his mistress, Maria Fitzherbert. As the Princess's poor treatment at the hands of her unpopular husband wins public sympathy, Caroline revels in her newfound role as political agitator. This was the premiere production of Battle Royal. Initially, as Zoë commented at the time, she 'thought everybody would compare it to The Madness of King George', a play about the Prince Regent's father also performed at the National Theatre, rather than see it as a work in its own right. She soon overcame her doubts, though: 'Howard Davies, the director, said he thought maybe he'd like to begin with something like... something like Caroline doing cartwheels across the stage. I just thought, ''That's great, I'll do it''' (see 'I Hate Luvvies' interview). Zoe's long-standing interest in dance is evident, as The Telegraph's Amanda Mitchison commented, in 'the physical confidence and expressiveness of some of her performances - when Princess Caroline has hysterical fits in Battle Royal even her toes participate' (see 'So Many Different Characters' interview). 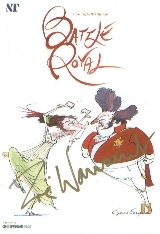 When Battle Royal's performance schedule prevented Zoë from opening a Shakespeare exhibition at the reconstruction of the Globe Theatre, which was built by her father, her friend Dame Judi Dench stepped in to help. As the Evening Standard reported, Dame Judi arrived to open the exhibition and quipped, 'I am here as Zoë Wanamaker's understudy'. Zoe and her Battle Royal co-star Simon Russell Beale returned to the National Theatre to play another sparring couple in a revival of Much Ado About Nothing, which opened in 2007. Zoe's other productions with the National Theatre Company include The Importance of Being Earnest (1982), The Bay at Nice and Wrecked Eggs (1986), Mrs Klein (1988), The Crucible (1990; also directed by Howard Davies), His Girl Friday (2003), and The Rose Tattoo (2007). Zoë has worked with four out of the five artistic directors at the National to date (i.e. Peter Hall, Richard Eyre, Trevor Nunn, and Nicholas Hytner). Strong ties with the company have led to her becoming a National Theatre Associate, giving her the power to influence the theatre's artistic policy. 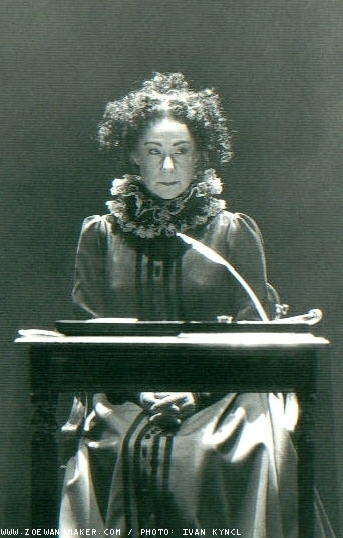 Critics were impressed by Zoë's performance in the play, notably The Stage's Peter Hepple, who observed that Caroline 'grows splendidly in dignity as she realises she has a right to become a queen'. Zoë conveyed 'the vulnerability and shrewdness behind the gawkiness' of the princess, said Benedict Nightingale in the New York Times. Terri Paddock at Whatsonstage.com and Glenn Loney at the New York Theater Wire also praised the performances given by Zoe and the other cast members. Site design and original text © 2002 - 2019 www.zoewanamaker.com, unless specified otherwise. Most images used on this site are the copyright of their photographer, Ms. Wanamaker, and/or the production company of the show. Use of these images is covered under the fair use limitation in the USA, and the fair dealing limitaton in the UK. This site is a non-commercial endeavour.